The descendants of Austrian-Jewish cabaret performer Fritz Grunbaum have been working for years to recover some of the art that Grunbaum owned in the years before the Nazis rose to power. 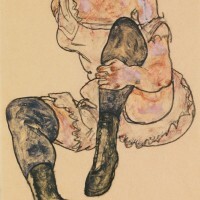 In the first decades of the twentieth century, Grunbaum amassed a significant art collection, including dozens of works by famed Expressionist artist Egon Schiele; but in 1938, Grunbaum was sent to a concentration camp in Dachau, where he died in 1941, and his wife died in a concentration camp in Minsk the following year. It’s not known for sure what happened to his art, but as pieces have appeared on the market decades later, his heirs have turned to the courts to try to reclaim them. As our previous post (here) explains, those efforts have met with mixed results. For example, in 2012, after seven years of litigation, the heirs lost a signficant case seeking to recover a Schiele artwork from collector David Bakalar. (The Second Circuit ultimately ruled that Bakalar owned the piece on the basis of laches, meaning, essentially, that the heirs had waited too long to seek the work’s return. See Bakalar v. Vavra, 819 F. Supp. 2d 293 (S.D.N.Y. 2011) and 500 Fed. App’x 6 (2d Cir. 2012).) In contrast, in 2014, they reached an out-of-court agreement with the possessor of a different Schiele work, pursuant to which the work was treated as looted art; the parties agreed that the work would be auctioned, the heirs would receive some compensation, and the buyer at auction would obtain clear title to the work. Now, the Grunbaum heirs have achieved a new victory. This case involves more Schiele art—specifically, two pieces that came to the heirs’ attention when UK-based art dealer Richard Nagy was marketing them for sale at a prominent art show in New York in the fall of 2015. Our previous post about this lawsuit (here) contains more detail on the parties’ initial positions. At the outset of the case, the court granted a temporary restraining order to ensure that the works could not be sold while the litigation was still pending, and the parties then agreed to have them stored for the duration of the case. But last week, after more than two years of litigation, Judge Charles Ramos has granted summary judgment for the plaintiffs. The court’s decision begins with a review of the facts presented by plaintiffs regarding the sad fate of Fritz Grunbaum and his art, including Nazi-era documents showing that, after Grunbaum was deported to a concentration camp, he was coerced into executing a power of attorney so that his wife could declare property on his behalf as required by the Nazi regime; from there, documents indicate that his art collection was inventoried and “blocked.” The defendants, for their part, presented evidence that Nagy’s title to the works can be traced back to Grunbaum’s wife’s sister, Mathilde Lukacs, who sold dozens of artworks to a Swiss gallery in the 1950s. Turning to the legal analysis, the court first clarified that New York law, not the law of some other jurisdiction (such as Switzerland), governs the dispute. That in itself was an important threshold issue because in New York, a thief cannot pass good title to an artwork, while in other jurisdictions (as we’ve seen in other cases, for example, here) there are certain circumstances where that might happen. For related reasons, the court rejected the defendants’ arguments that the claims here were barred by foreign law and international comity concerns. The court also took note of one important legal development since the Bakalar decision: in 2016, Congress passed the Holocaust Expropriated Art Recovery Act of 2016 (also known as the HEAR Act), which sought to ensure that claimants of Nazi-confiscated art would not face unfair barriers due to the passage of time involved in such cases. The HEAR Act creates a nationwide statute of limitations on claims regarding property lost during the Nazi regime; it provides that such claims are timely if they are filed within six years of when the claimant actually discovers the identity and location of the property and their possessory interest in it. Here, against this backdrop, the court cited its duty to “be mindful of the difficulty of tracing artwork provenance due to the atrocities of the Holocaust era, and to facilitate the return of property where there is reasonable proof that the rightful owner is before us.” And on the facts presented, the court held that there was “no triable issue of fact as to whether the Artworks belonged to Mr. Grunbaum before World War II.” Indeed, the defendants’ own provenance documentation confirmed that the Swiss gallery listed the works as having passed from Fritz to his wife to her sister. From that starting point, the court held that not only were the works Grunbaum’s property but they were looted by the Nazis; thus, plaintiffs made a prima facie case on their replevin and conversion claims. The burden thus shifted to the defendants to raise a triable issue of fact that the works were not stolen. And here, the court held, “Defendants have neither presented evidence nor raised a triable issue of fact to show that Mr. Grunbaum voluntarily transferred the subject artworks during his lifetime,” and emphasized, “A signature at gunpoint cannot lead to a valid conveyance.” And because defendants could not show that Ms. Lukacs was the valid owner of the works, their title was invalid as well. (Interestingly, the court noted that the Swiss dealer who received the works from Lukacs had testified inconsistenty in the Bakalar case as to what he knew about Mr. Grunbaum’s ownership of the works.) And under New York law, the fact that Nagy may have bought the works in good faith does not defeat plaintiff’s claims here. This case represents one of the first court decisions to apply the HEAR Act. (We wrote about another such decision here.) The United States has for several years been a party to international treaties, including the 1998 Washington Conference Principles on Nazi Confiscated Art and the 2009 Terezin Declaration on Holocaust Era Assets and Related Issues, which set forth guidelines for how Nazi-looted art claims should be adjudicated, but those treaties are non-binding (although some courts have looked to those declarations in a limited way for guidance about federal policy in cases involving Nazi-era art). The HEAR Act, on the other hand, is now the law of the land and preempts any conflicting state law. Decisions like this one show that non-binding general aspirational statements are no substitute for concrete legislation. It’s important to note, though, that the HEAR Act was only one component of this decision; after all, the HEAR Act deals with “defense[s] at law relating to the passage of time,” not with the overall substance of Nazi-era art claims. The plaintiffs in this case—and in general in cases like this—must still put forward enough evidence on the actual merit of their claims, to show that their right to the property is superior to that of the current possessor. Here, the court was clearly moved by the idea that, from 1938 on, through the actions of the Nazi regime, Grunbaum was robbed of the opportunity to make any voluntary choice about where his art should go, and thus the fact that the art apparently ended up in his sister-in-law’s possession did not mean that she was the rightful owner. As our many posts on cases involving Nazi-era art illustrate, this area of law has, arguably, only grown more complex over time and as litigation has proliferated and waded into incredibly difficult questions of law, fact, and policy. While some parties continue to litigate (often for years), others are turning to negotiated agreements to settle such disputes in a way that courts may not be able to. For now, this case is not over; the two artworks at issue remain in storage with a third party, and Defendants are planning to appeal, insisting that they have shown at least a triable issue of fact that the works were not stolen by the Nazis. We’ll continue to follow this case, which represents just one example of the art world’s struggle to come to terms with the chaos wrought in the years surrounding World War II.